After trawling eBay for a few weeks we finally found an awning, in Gloucester! Only one thing for it, our 3 days off midweek are going to be spent in Cirencester. We are quite lucky to have 3 days off during the week, every other week come hail or shine we try to get our Pursuit out, we don’t normally need an excuse. Unlike other midweek trips out we are a little more organised this time. We booked a pitch at Cirencester Caravan Club site the day before. I even shopped for a few foody bits to take with us the night before. In true tradition though we packed in the hour before walking out of the house. Legs up, hitched up and off on our journey. A couple of hours away, we normally wouldn’t go that far for two nights but we had a reason this time, a new to us awning. Our little Orion had a full Dorema awning. Since changing caravans we knew that for longer trips during the warmer months we would want the extra indoor/outdoor space. We had decided against another full awning as the Pursuit is so long we really didn’t need one quite that big. 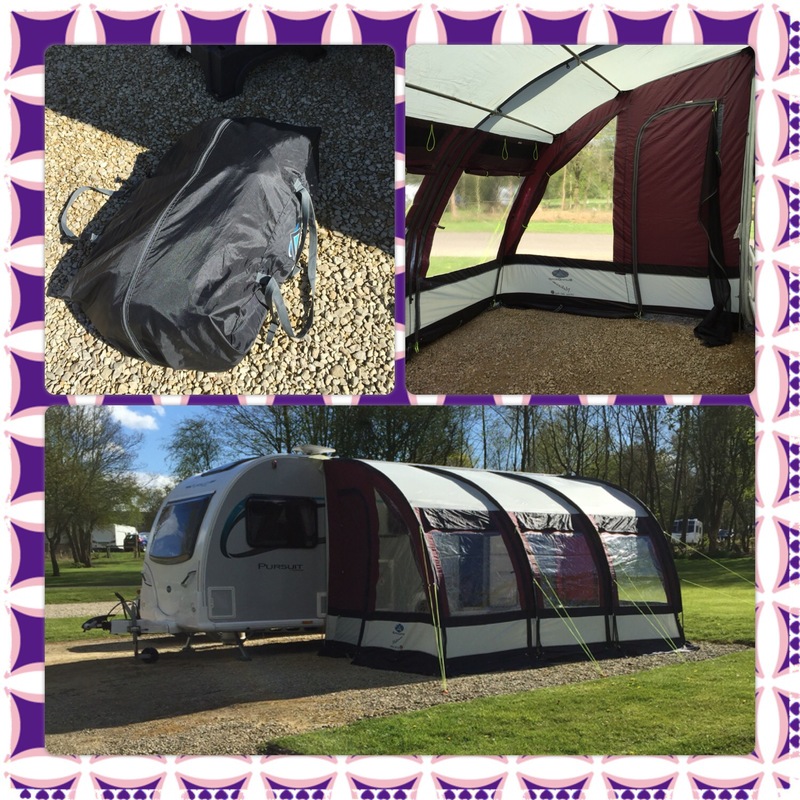 After being outbid on a few different makes we finally got a Sunncamp Platinum Ultra 390 Plus. 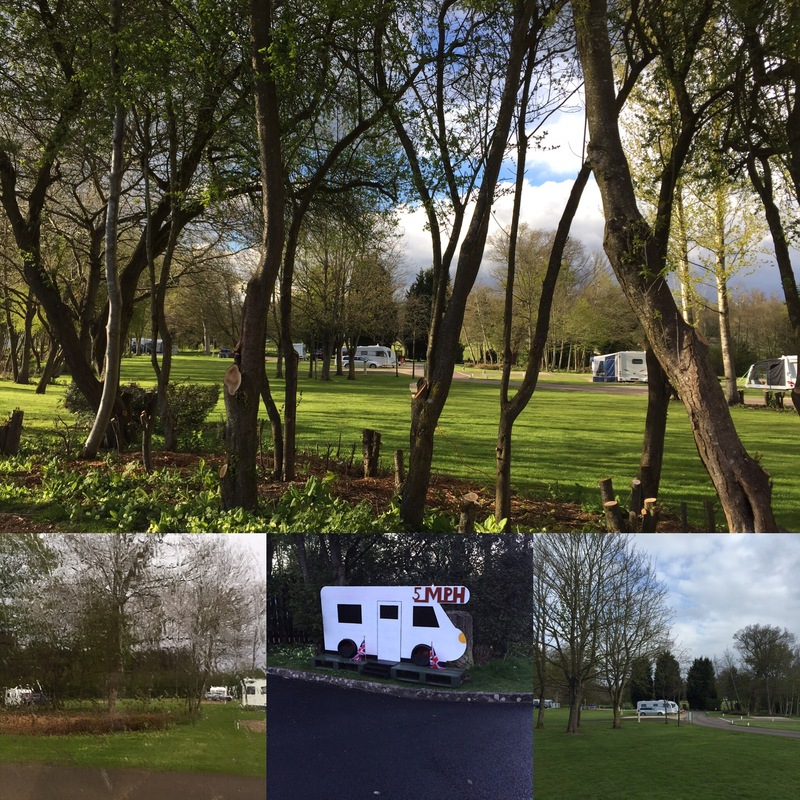 The Cirencester Caravan Club site is a little piece of tranquility on the outskirts of the hustle and bustle of the market town centre. Met and welcomed by a lovely warden who went through where the best pubs, restaurants and supermarkets were. A quick drive round the site we chose to head off towards the far side of the site. It neighbours with the local 6th form college which in itself seemed very quiet student wise, we were, however, very aware of the presence of scaffolding and builders. Even these turned out not to be a problem from our chosen pitch. Peace and quiet reigned supreme for both days and nights. After a quick bite to eat we were back on the road to collect our awning. Safely stowed in the boot we headed back wondering on the way whether or not the wind was favourable for a very lightweight awning. Did we put it up? Of course we did! Up it went with relative ease and no cross words. Never really understood why they are referred to as a ‘Divorce in a Bag’ we always seem to manage. Instantly liked the extra space that the awning provided. It was going to mean that we could leave the table and chairs set up and also provides good storage for when we take the tandem away with us. The only disadvantage we found was waking up in the morning and having condensation dripping. Open to ideas on how to deal with this. Notice boards around the site told us that local takeaway services visited the site. 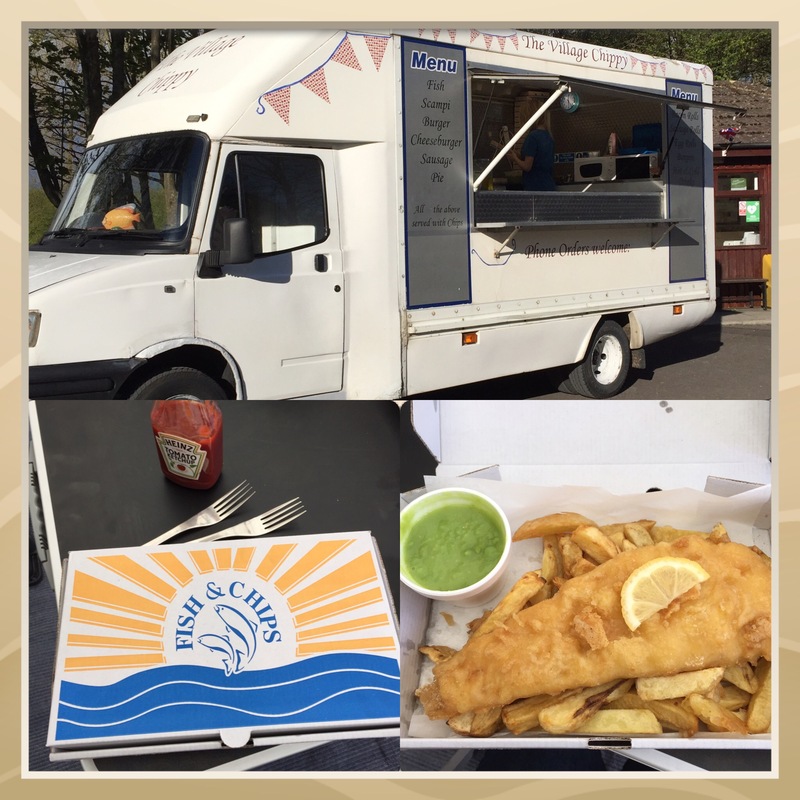 Pizza on Thursday and fish and chips on Tuesday. It would seem a shame not to wouldn’t it? The van parked up near the information office at the entrance of the site and an orderly queue started to form. Having used takeaways on site once before I wondered if it would be the same kind of experience. It was. A very sociable queueing experience. We got chatting to a lovely gentleman from the north west, our neck of the woods, who laughed at my supposed northern/southern accent. Having been an honorary southerner for 10 years I thought I’d hung onto my dulcet northern tones. Chatting always makes waiting pass quicker and as each customers food was cooked to order it didn’t seem like long before ours was ready. Back in the warm we prepared to tuck in. The portions were huge! I think my Fitbit is going to be showing a red day. When we bought this caravan at the back end of 2015 we decided we would start a caravan log , noting total miles travelled, nights away, site costs etc. Decided that it would be great looking back over the year and seeing the amount of sites we visited, miles we drove and costs we spent. We always add a little note too about the site to remind us if it’s worth revisiting. 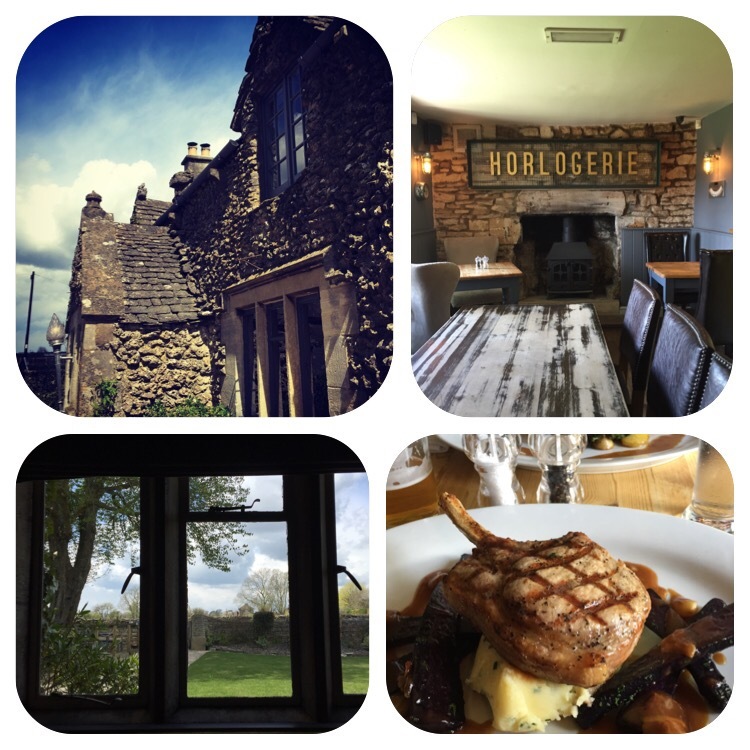 This midweek break was going to give us our 19th night away since November. With a good few more nights booked for May it’s looking good for 2016. Wednesday brought showers, hail storms, wind and sunshine all in one day. Sitting with a cup of tea and Ken Bruce on radio 2 watching as people tried to dodge the four seasons in one day. 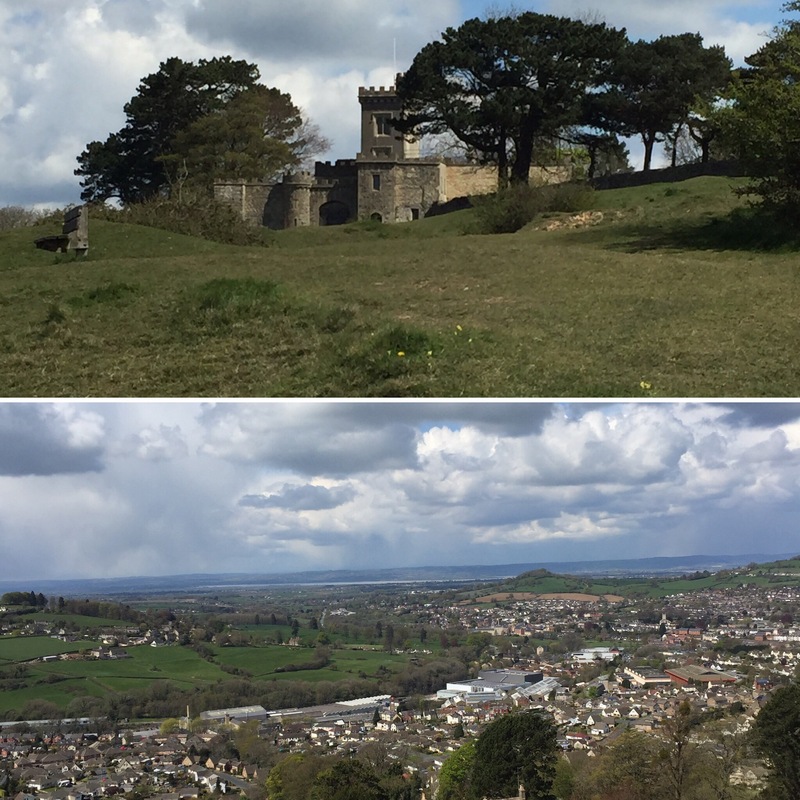 On picking up the awning yesterday, we drove through a lovely little town, Minchinhampton, with Rodborough Common on the outskirts. A quick walk to get my Fitbit steps up to par revealed the most stunning views from what appeared to be the top of the world. Lunchtime seemed to bring darker more threatening clouds, we headed towards a pub, The Ragged Cot, for lunch. A really old pub that was once a hospital that boasted of visits of past Kings and Queens seemed like the perfect venue. After last nights big tea I’d decided on something light, a salad maybe. Swayed by the menu, salad wasn’t shouting out at me as loudly as it should have been. I ordered the pork chop. It arrived in all its splendour, beautifully presented on a bed of chive mash. I wasn’t going to need tea tonight. After polishing that lot off we headed back for a little nap. After our little nap and we were feeling refreshed and needing to walk off our rather heavy lunch. We looked at doing the short walk into town through the neighbouring Bathurst Estate. 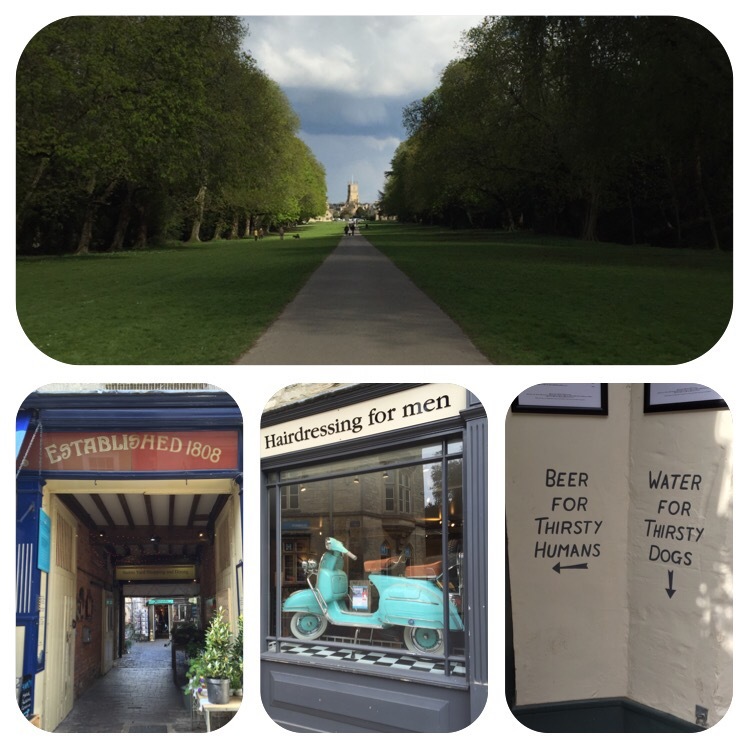 A beautiful 15 minute walk at the most into the centre of Cirencester. No matter what I don’t think any amount of walking is going to burn off the calories consumed over the last couple of days but when when food is as good as it’s been as a one off treat I don’t mind. Cirencester is architecturally beautiful and for whatever reason I failed to get photos of the Cotswold Stone market town in all its splendour. Choosing to snap entrances to quaint courtyard shops and pub signs. The showers continued on and off into the evening, fortunately we’d managed to dodge them all day without getting wet once. Final night in the caravan, always a bit sad. I get that Sunday night feeling on my last night knowing that life will return to normal tomorrow. I suppose as far as my diet is concerned that’s not a bad thing. We wouldn’t normally put an awning up for just 2 nights but with it being new to us we felt it needed to go up so that we could check it out. After the showers of the day it was still wet, we decided to keep our fingers crossed for a dry morning tomorrow and take it down then. We were blessed, sunshine and a light breeze soon had it dry. Dropped and stored away back in its bag in no time at all. Legs up. Hitched up. Lights checked. Goodbye Cirencester thank you for a lovely couple of days. We recognise some of the locations from our map. What a lovely part of England and so well described.